The Michigan No-Fault Act was adopted in 1973, and since then, there have been over 4000 Michigan appellate court opinions regarding the law. Sinas Dramis Law Firm has written case summaries regarding virtually all these opinions and continues to do so at the present time. 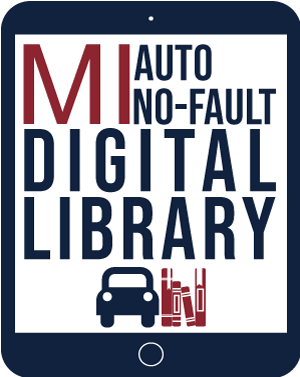 The Michigan Auto No-Fault Law Digital Library is a compilation of all the case summaries from Sinas Dramis Law Firm. The case summaries are freely provided to further our goal of educating the public about the Michigan Auto No-Fault Law. The Digital Library is fully searchable. Therefore, searching by case name or relevant terms is a good way to find the case summary and opinion. There is also an indexing system that allows you to find a case through a statutory index, topical index, alphabetical index, or chronological index. To make it easy for the public to understand the latest developments in the law, the recent case summaries are listed below. In this case regarding disqualification of PIP benefits on the basis of fraud, the Court of Appeals determined that defendant insurance company had not proven by "clear, convincing, and satisfactory evidence" that plaintiff had committed fraud, as would be necessary to support summary disposition. In this case regarding assignments of benefits, the Court of Appeals determined that the anti-assignment clause in insured's policy did not bar him from assigning his rights to a medical provider, nor were his assignments impermissible as partial assignments. In this case regarding entitlement to PIP benefits, the injured plaintiff failed to create a genuine issue of material fact as to whether the care he received in an assisted living facility was causally related to his motor vehicle accident. In this case regarding assignments of benefits, the Court of Appeals determined that an insured's medical provider should have been allowed to amend its complaint to reflect a valid assignment of rights. In this case regarding governmental immunity, the Court of Appeals determined that a question of fact existed as to whether a defendant police officer's actions constituted negligent operation of a motor vehicle, gross negligence, and were the most immediate, efficient, and direct cause of the plaintiff's injuries. In this case regarding prejudicial assertions at trial, the Court of Appeals found plaintiff’s statements at trial regarding defendant insurance company’s voluntary payment of PIP benefits were not made in an attempt to prove that plaintiff had suffered a serious impairment of body function in her third-party case. In this case regarding assignment of rights and the one-year-back rule, the Court of Appeals ruled that plaintiff medical providers were precluded from recovering no-fault benefits incurred between the filing date of the original complaint and the date of assignment. The assignment of rights only gave plaintiffs the right to seek no-fault benefits for losses incurred within one-year of the assignment of rights, and did not relate back to the filing date of the original complaint. In this case regarding assignment of rights, the Court of Appeals held that an injured motorist could “split his cause of action for PIP benefits into separate claims” and assign them to multiple medical providers, that an anti-assignment clause in the motorist’s no-fault insurance policy was not valid, and that the motorist could assign his rights to disputed, unpaid PIP benefits. In this case regarding assignment of rights, the Court of Appeals held that the injured plaintiff could assign his rights to PIP benefits to a medical provider, despite not having an insurance contract with the defendant insurance company. Both statutory and contractual rights to PIP benefits are assignable. In this case regarding assignments of rights, the Court of Appeals found the anti-assignment provision in the injured motorist’s insurance policy to be unenforceable. The Court also held that the injured motorist could in fact split his cause of action for no-fault benefits between multiple providers. A claim for no-fault benefits need not be assigned in its entirety; partial assignments are, in fact, valid. In this case regarding the injury threshold standard under McCormick, the Court of Appeals determined that a question of fact existed as to whether plaintiff suffered an objectively manifested impairment, and, if so, whether the impairment was truly caused by the plaintiff’s motor vehicle accident. In this case regarding the rights of medical providers seeking to pursue direct causes of actions against insurance companies, the Court held that Covenant was retroactive, thereby precluding the plaintiff medical provider from pursuing a direct cause of action against the defendant insurance company. In this case regarding priority payment of benefits, the Court of Appeals ruled that the coordination of benefits provisions in the plaintiff’s medical insurance policy rendered defendant insurance company the primary payor for 50% of plaintiff’s allowable expenses, because plaintiff’s medical insurance policy expressly disavowed up to 50% of allowable expenses if plaintiff had other coverage. In this case regarding an injured driver’s tort claim arising out of an accident with another driver, the Court of Appeals reversed the trial court’s grant of summary disposition in favor of the at-fault driver. The Court reasoned that a genuine issue of fact existed as to whether the plaintiff’s injuries were a direct result of the accident. In this case regarding disqualification of PIP benefits due to fraud, the Court of Appeals found plaintiff to have committed fraud by testifying in a deposition that she was unable to drive, even though there was evidence that she had driven herself to the deposition. In this case regarding the parked vehicle exception to first-party PIP benefits, the Court of Appeals reasoned that Plaintiff was not alighting from the parked bus within the meaning of MCL 500.3106, the parked bus was not being utilized as a motor vehicle when it was parked, and there was no casual connection between the injury and the parked vehicle. In this case regarding the retroactivity of Covenant Med Ctr, Inc v State Farm Mut Ins Co, 500 Mich 191, 196; 895 NW2d 490 (2017), the Court of Appeals found that Covenant applied retroactively to cases pending on appeal. In this case regarding Plaintiff’s ability to live his normal life under MCL 500.3135(5), the Court of Appeals reasoned that Plaintiff’s life was unaffected by the accident because before the accident Plaintiff lived a severely limited and sedentary lifestyle. In this case regarding liability under MCL 257.401, the Court of Appeals found that MCL 257.401 was not limited to negligent entrustment cases and it created a duty between a short-term lessor and the public for purposes of a negligence action. In this case regarding disqualification from PIP benefits due to fraud, the Court of Appeals found that Plaintiff committed fraud because Plaintiff signed his name to false attendant care forms and submitted the forms to his no-fault insurer. In this case regarding the issue of serious impairment of body function, the Court of Appeals found a genuine issue of material fact regarding Mario Gavino’s general ability to live his normal life. In this case regarding the failure to maintain no-fault insurance coverage pursuant to MCL 500.3101(1), the Court of Appeals reasoned that a boyfriend who did not live with Plaintiff, but provided no-fault coverage for the vehicle in question, was not the owner of the vehicle, and therefore Plaintiff was excluded from PIP benefits. In this case regarding the meaning of an arbitration agreement and res judicata, the Court of Appeals reasoned the terms of the arbitration agreement, not the award amount, dictated the scope of the agreement and res judicata therefore barred the Plaintiff’s action. In this case regarding false and material statements made on an application for benefits with the Michigan Automobile Insurance Placement Facility, the Court of Appeals reasoned that there was irrefutable evidence Plaintiff had made false and material statements. In this case regarding the issue of collateral estoppel in an arbitration agreement, the Court of Appeals found the Plaintiff was barred from bringing forward her case because there was a final judgment on the issue, since there was a jury trial; there was an opportunity for Plaintiff to fully litigate the issue, since Plaintiff negotiated away her right to appeal; and there was mutuality of estoppel. In this case regarding the charges owed to a medical provider by a no-fault insurer, the Court of Appeals held that a medical provider has a direct cause of action for a payment of the unpaid portion of its medical care against a no-fault insurer, even after an audit conducted by the patient’s no-fault insurer deems the charges unreasonable. However, in order to contest the reasonableness of the amount paid or pursue the remaining balance of its bill, a provider must file a lawsuit against its patient within 1 year, in accordance with MCL 500.3145. In this case regarding the issue of serious impairment of body function, the Court of Appeals affirmed summary disposition for Defendant because it found there was no medical evidence linking the accident to Plaintiff’s subjective complaints. In this case regarding the issue of an anti-assignment clause in a no-fault contract, the Court of Appeals found that its prior holding in Jawad A Shah, MC, PC v State Farm Mut Auto Ins Co, 324 Mich App 182, 208; ___ NW2d ___ (2018) barred anti-assignment clauses in no-fault contracts because they were against public policy. In this case regarding disqualification to no-fault benefits for unlawful taking of a vehicle pursuant MCL 500.3113(a), the Court of Appeals found Plaintiff was disqualified because he did not have permission to use the vehicle in question and there was no evidence to support his claim. In this case regarding the application of the one year back rule to an assignment of benefits claim, the Court of Appeals denied Plaintiff’s claim because it found that only one of the three assignments was not for future benefits and the proper assignment occurred more than one year after Plaintiff rendered its services. In this case regarding alleged fraud, the Court of Appeals found a genuine issue of material fact because there was conflicting testimony regarding Plaintiff’s work schedule, conflicting testimony if Plaintiff left his job, and there was no paper record of Plaintiff’s work history. In this case regarding the issue of vehicle ownership, the Court of Appeals found a genuine issue of material fact regarding ownership because the driver of the motor vehicle had access to the vehicle, free control of the vehicle, and used the vehicle. In this case regarding the failure of Plaintiff to demonstrate a causal relationship between his injury and his motor vehicle accident, the Court of Appeals found that a reasonable fact finder could find a connection between the accident and injuries Plaintiff suffered. In this case regarding a medical provider’s independent cause of action and the one year back rule, the Court of Appeals reasoned that an assignment of benefits only relates back to one year before the assignment. In this case regarding first-party PIP benefits, the Court of Appeals found that Plaintiff’s no-fault policy had expired prior to his accident and, alternatively, Plaintiff had engaged in misrepresentation or fraud when he applied for his no-fault policy. In this case regarding a valid assignment of benefits, the Court of Appeals reasoned the assignment instrument was not specific enough to create a valid assignment. In this case regarding fraud/misrepresentation, the Court of Appeals reasoned that the evidence presented by Plaintiff directly contradicted Defendant’s allegation of fraud/misrepresentation and created a genuine issue of material fact. In this case regarding first-party PIP benefits for domiciled relatives, the Court of Appeals found that no-fault insurers can be required to provide first-party PIP benefits for domiciled relatives who are injured while driving motorcycles and involved in motor vehicle accidents under MCL 500.3114(5). In this case regarding Plaintiff’s uninsured vehicle being involved in the accident, the Court of Appeals found a genuine issue of material fact because the vehicle was not physically involved in the accident and it did not move during the accident. However, the Court upheld the trial court’s order granting summary disposition against a medical provider because it lacked standing to bring the case. In this case regarding payment for home modifications in a first party PIP case, the Court of Appeals found that case law will allow the trial court to establish future obligations for home modification for PIP benefits. In this case regarding the enforcement of an anti-assignment provision in the no-fault policy, the Court of Appeals found that anti-assignment provisions are against public policy and unenforceable. In this case regarding the priority of coverage, the Court of Appeals reasoned that an employer’s no-fault insurance contract, which included the injured person as a potential claimant, was of higher priority than the injured individual’s personal insurance policy. In this case regarding a motion to amend a complaint, the Court of Appeals found that amending the complaint would not burden Defendant and the motion should be granted to Plaintiff. In this case regarding the one-year-back rule, the Court of Appeals reasoned that the medical provider was limited to only those expenses incurred one year prior to the assignment of benefits pursuant to the one year back rule. The Digital Library is fully searchable!